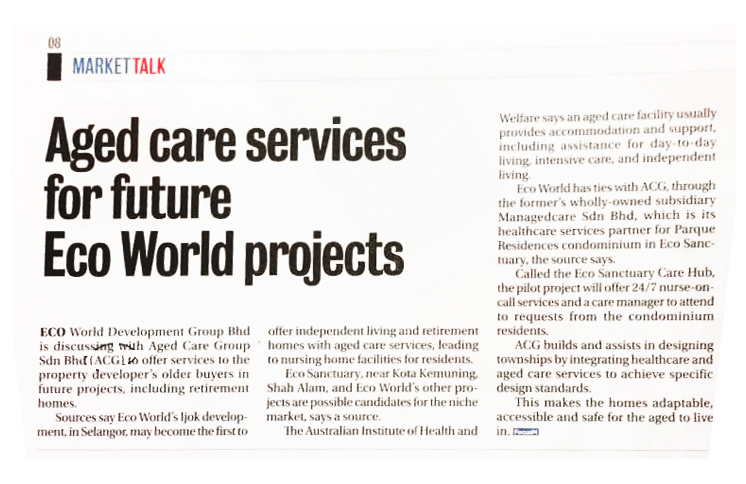 Eco World Development Group Bhd is discussing with Aged Care Group Sdn Bhd (ACG) to offer services to the property developer‘s older buyers in future projects, including retirement homes. Eco World‘s Ijok development in Selangor, may become the first to offer independent living and retirement homes with aged care services, leading to nursing home facilities for residents. Eco Sanctuary, near Kota Kemuning, Shah Alam, and Eco World‘s other projects are possible candidates for the niche market. The Australian Institute of Health and Welfare says an aged care facility usually provides accommodation and support, including assistance for day to day living, intensive care, and independent living. Eco World has ties with ACG, through the former‘s wholly owned subsidiary, Managedcare Sdn Bhd, which is the healthcare services partner for Parque Residences condominium in Eco Sanctuary. Called the Eco Sanctuary Care Hub, the pilot project will offer 24/7 nurse-oncall services and a care manager to attend to requests from the condominium residents. ACG builds and assists in designing townships by integrating healthcare and aged care services to achieve specific design standards. This makes the homes adaptable, accessible and safe for the aged to live in.